I have a fresh install of Mojave and of Mindstorms Ev3 home edition. It seems to work fine but then randomly all the information disappears from the blocks at the bottom of the screen, and sometimes in the program too. See screenshot. This problem persists until I restart the software. Any tips? Note: easy way to reproduce this problem is clicking on a block link from the documentation area, like the 'Loop' block in the screenshot below. It seems to cause the corruption every time. I contacted Lego support and they got back to me with a fix, which worked great. It also has greatly improved the performance of the application. Updating Silverlight to the most current version 5.1.41212.0 solved it ! 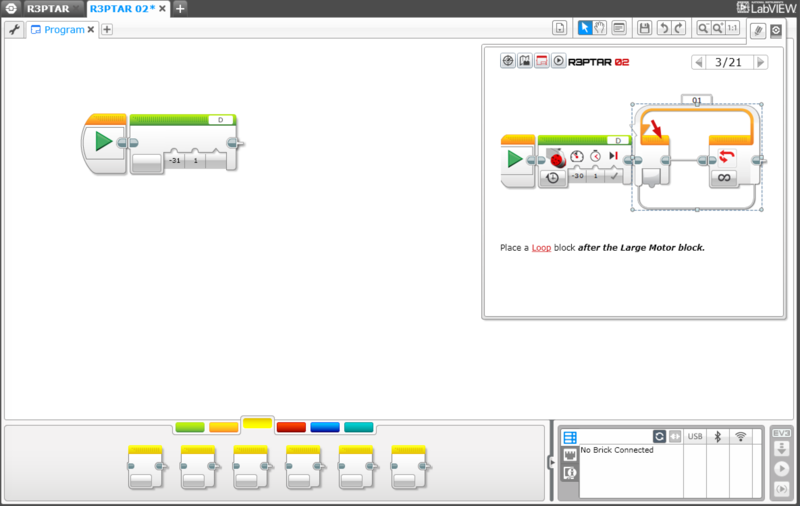 Now the Lego Mindstorm EV3 Software works fine. What fixed it for me was to download the latest installer from lego.com and run the installer again. It doesn't make sense because before I did this, I went to "Check For Updates" in Mindstorms and it says there was none. But something clearly changed, because before the reinstall, there was a non-intuitive little tab with the EV3 logo on it on the top left (as seen in the original question's screenshot) and after the reinstall, that tab has "Lobby" labeled next to the icon. Updating silverlight didn't help. I did not try the mono suggestion. Not the answer you're looking for? Browse other questions tagged ev3 mindstorms mac or ask your own question. Could I do datalogging in Mindstorms EV3 Home edition? Does the Lego Mindstorms EV3 software work on macOS High Sierra?